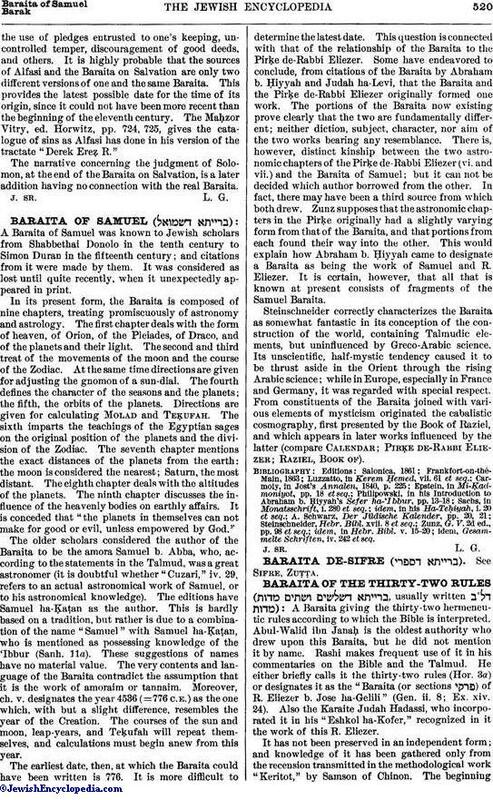 A haggadic Baraita, which Schönblum (Lemberg, 1877) published for the first time in the collection "Sheloshah Sefarim Niftaḥim." It enumerates twenty-four sins which delay the [Messianic] salvation and prolong "the end" ("ha-ḳeẓ"); i.e., the destined redemption. For each of these sins a Bible verse is quoted, which illustrates its gravity. In most cases haggadic narratives are adduced for the same purpose. These are taken from the Talmud and from Lam. R. It is questionable whether the Baraita availed itself of Num. R. as is assumed by the editor. The citation which might imply such a fact may have been derived from a source common to the Baraita and Num. R. Every clue is lacking for a determination of the exact age of this Baraita. At all events, a very early Palestinian origin is indicated by the frequent use of Yerushalmi and Lam. R., and the possible lack of all citations from Babli. Some kinship must exist between the Baraita and the enumeration by Alfasi (Yoma, toward end) of twenty-four hindrances to repentance. This catalogue of sins Maimonides ("Yad," Teshubah iv.) reduced to a system in which every point was accompanied by an illustrative commentary. In Maimonides' time the source on which Alfasi drew was no longer known, and Maimonides merely supposes that it was of recent origin ("Peer ha-Dor," No. 12). Joseph Caro (in his Commentary on Maimonides, or "Yad," Hilkot, Teshubah, iv. 1), however, gives information of a manuscript, according to which the twenty-four hindrances to repentance formed an independent Baraita, "in small tracts" ("be-massektot ḳeṭanot"; see Brüll, "Jahrbücher," ii. 127). The Baraita on Salvation and Alfasi agree not only in regard to the number of the things that prevent the salvation of mankind in general as well as of the individual, but also in regard to the nature of these obstacles. Thus, both enumerate seduction to evil,the use of pledges entrusted to one's keeping, uncontrolled temper, discouragement of good deeds, and others. It is highly probable that the sources of Alfasi and the Baraita on Salvation are only two different versions of one and the same Baraita. This provides the latest possible date for the time of its origin, since it could not have been more recent than the beginning of the eleventh century. The Maḥzor Vitry, ed. Horwitz, pp. 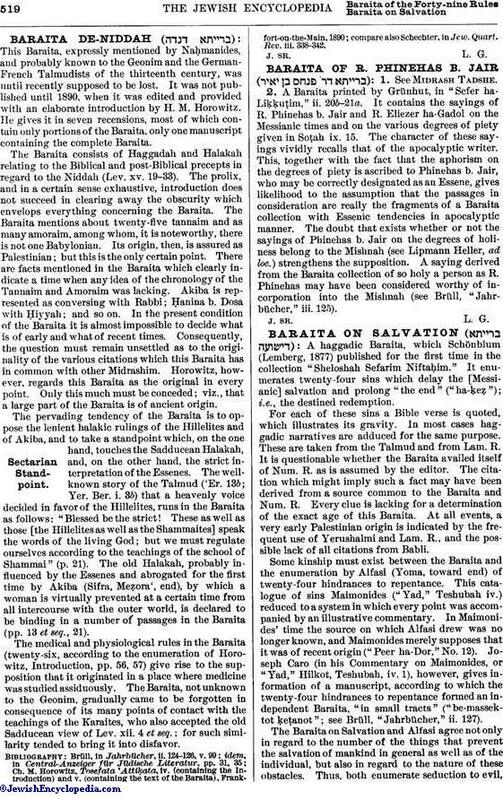 724, 725, gives the catalogue of sins as Alfasi has done in his version of the tractate "Derek Ereẓ R."
The narrative concerning the judgment of Solomon, at the end of the Baraita on Salvation, is a later addition having no connection with the real Baraita.